Large to very large, briliant dark red flowers that may be either semi-double or anemone-form double. The growth is vigorous and upright, with a tendency to spread. Young plants usually have a fairly open habit, but filling out with age. Flowering period is March to April. 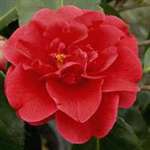 This camellia was a present sent to friends who had been entertaining my wife and me. It arrived on time and in good order, and is reported to be a handsome plant that promises well.